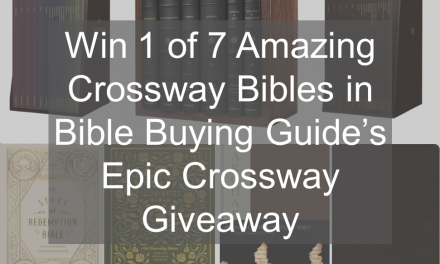 Crossway’s 6-Volume Reader’s Bible was made specifically for reading. 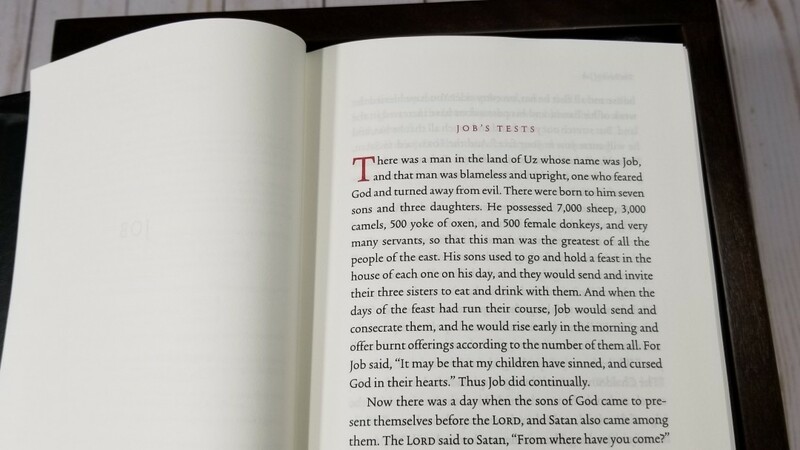 It doesn’t suffer from the typical compromises that Bibles have to make in order to get the entire text in a single volume while providing references, footnotes, and other tools. 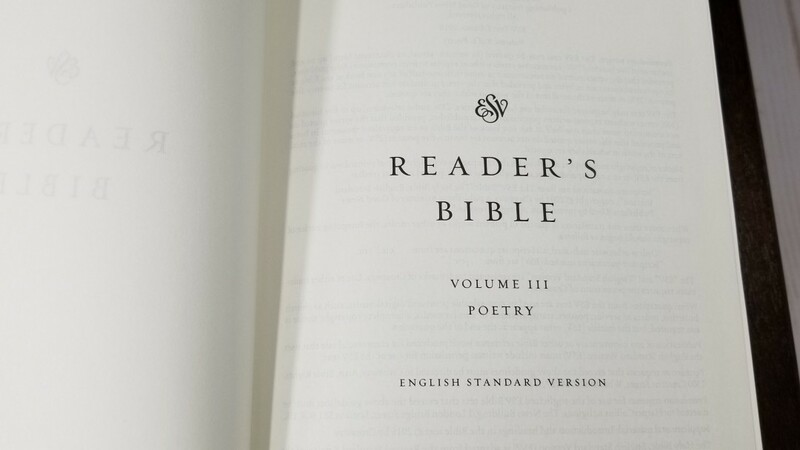 It removes It removes all of the extras that hinder readability including the chapter and verse numbers that we have imposed on the text just for our own convenience. It uses thicker paper, larger fonts, larger leading, and a smaller column-width. The result is a smoother reading experience with improved comprehension and engagement. 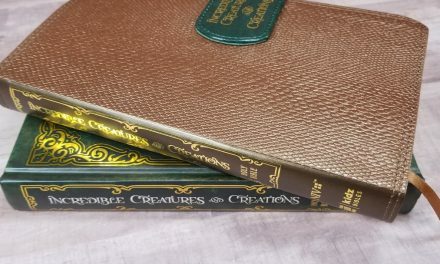 It’s available in softcover with cardboard slipcase (ISBN: 9781433558948), cloth over board with cardboard slipcase (ISBN: 9781433553479) and cowhide over board in a hand-made walnut slipcase (ISBN: 9781433562228. I’ve previously reviewed the cloth over board set. In this review, I’m taking a look at the cowhide over board. The overall size is 8 x 5.5. 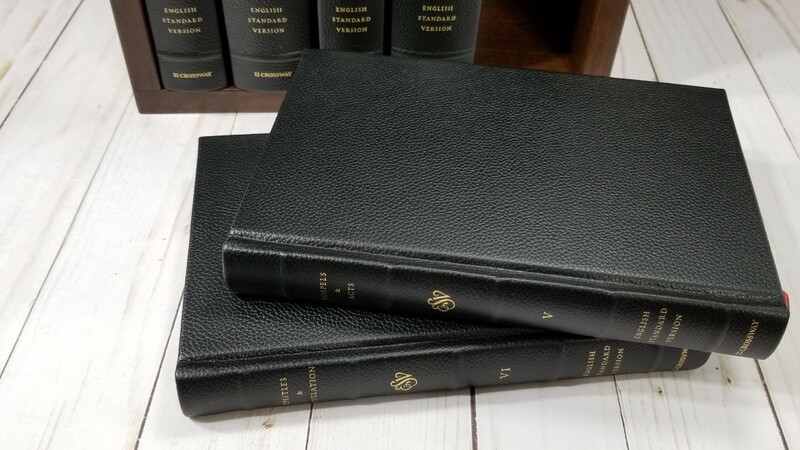 The smallest edition is 1″ thick while the largest edition is 1.75 ” thick. This size is excellent for holding and reading for long periods of time. It comes with a nice little booklet that shows a lot of production information including the materials, and even the type of press that was used. It was printed and bound in Italy by L.E.G.O. (Legatoria Editoriale Giovanni Olivotto). 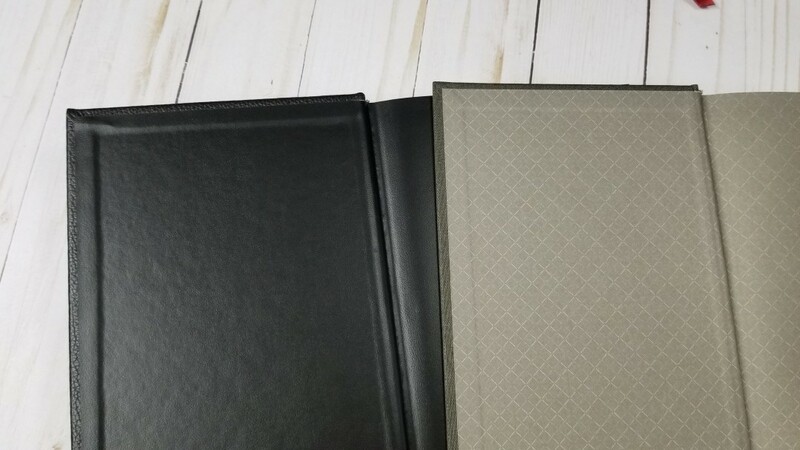 These are hardcover editions with black cowhide over board. This is top grain Costarica Lux cowhide leather. It has a pebbly grain that looks and feels elegant. The liner is black vinyl. 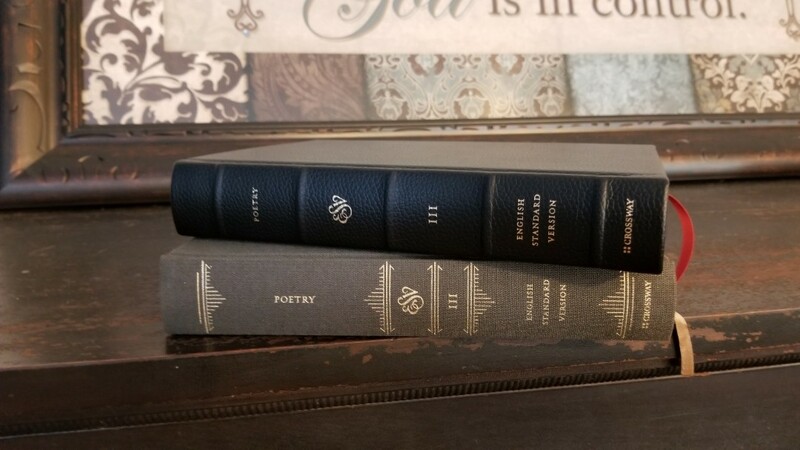 The spine has five raised ribs with the book title, ESV, volume number, English Standard Version, and Crossway printed in gold. 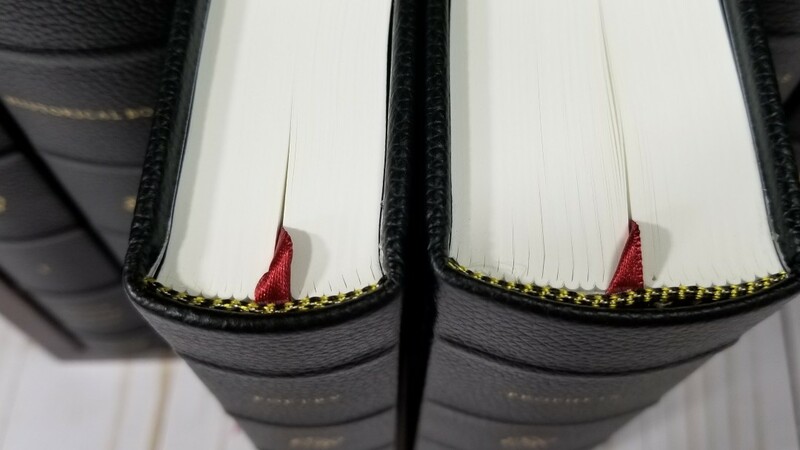 The books are Smyth-sewn with 48-page signatures, using the exact amount of thread tension for the perfect spine flexibility. It also uses cold-setting glue so it will lay flat. It was bound and covered in a climate-controlled facility, so there isn’t any warping. 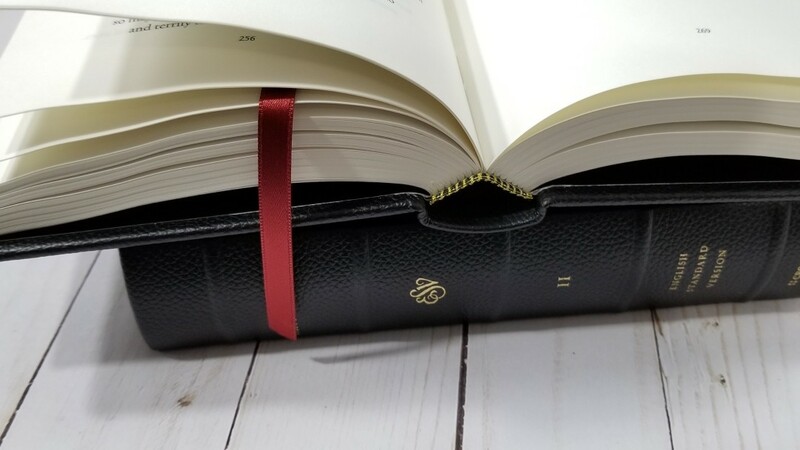 Each book includes a deep red ribbon and gold/brown head/tail bands. The paper is 80 gsm Munken Premier Cream uncoated paper that’s imported from Sweden. It’s highly opaque and has no glare at all. It’s cream in color and is excellent for reading for hours at a time. I find it easy to turn. All total, it has 3364 pages. The page edges are not gilted. The text is presented in single-column paragraph format with no chapter or verse numbers, no references or footnotes, and only a few section headings. The header shows the book name in the left and right corner, or a section heading in the right corner. They’re printed in an elegant font. 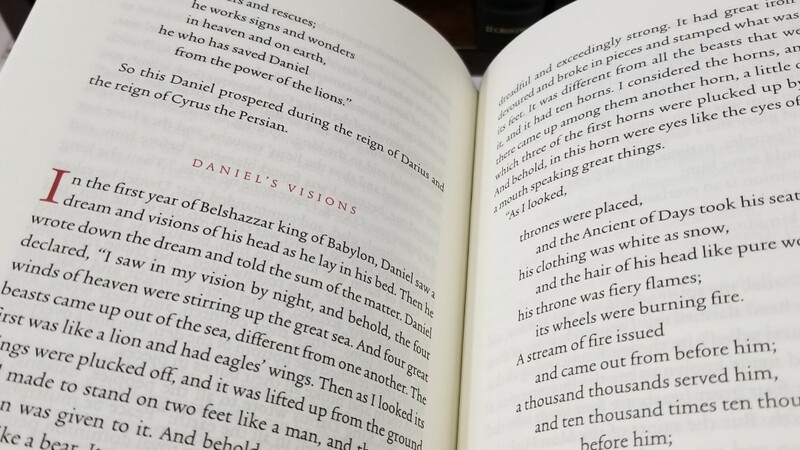 The first verse in a book or section has a drop-cap. Drop-caps, book names, and headings are in red. The typeface is a 12-point black letter Trinité No.2 Roman font designed by Bram de Does from The Enschede Font Foundry, and printed in Inkcredible Revolution Black ink. 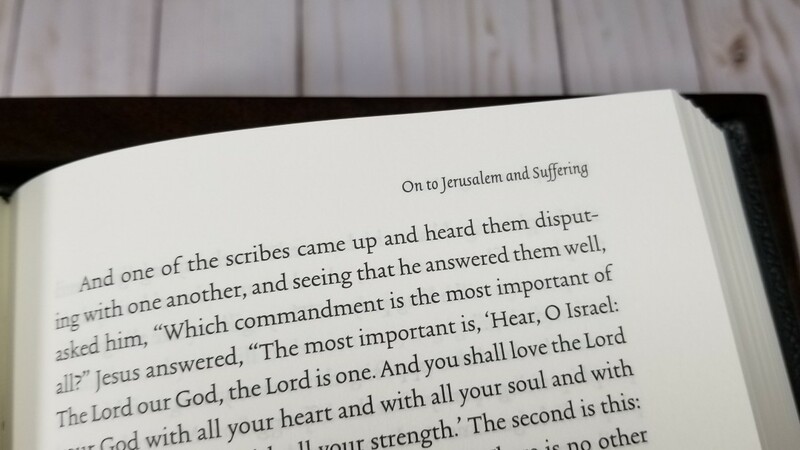 The 15-point leading (size of the font plus the space between the lines) give the text enough white-space to breathe without making it feel like a giant print Bible. It’s excellent for reading. It has no chapter markings of any kind. This does make it difficult to know where one chapter ends and another one starts, but this also gets rid of un-natural stopping points and helps you see the bigger context. It does have a few section headings. There aren’t that many. They’re not the standard section heading- just a few to break up the book into about 3-4 parts for the major sections. Most are in the historical books. They almost seem out of place at first, but they do help with the context. I wouldn’t mind if it didn’t have them. It has around 61-64 characters across with around 12 words per line and 28 lines per page. This fits perfectly with my ideal 10-12 words per column with a character-count in the mid to low 60’s. 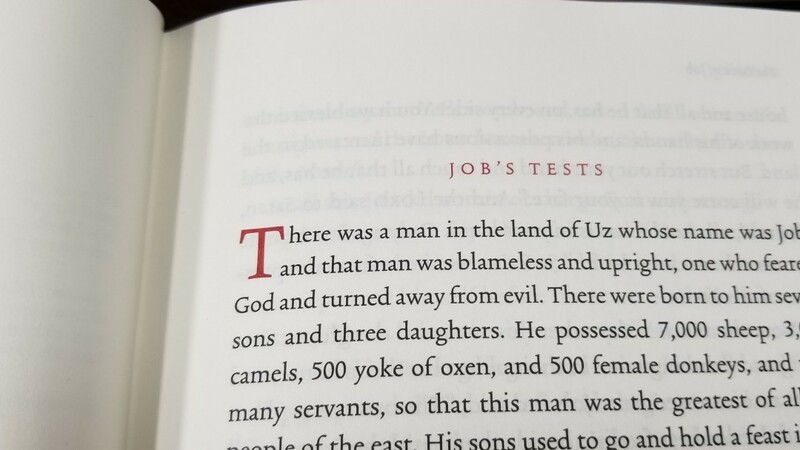 There’s enough inner margin to bring the text out of the gutter so it lays flat on the page. I never lose my place. The layout is the standard ESV format. Poetry is affected a little bit by the low to mid 60’s character count, a few of the lines wrap a word or two to the next line, but it does have more white-space than normal. 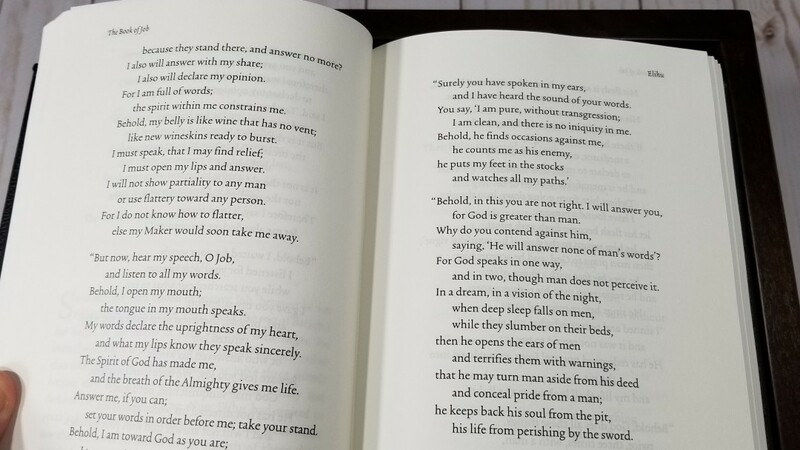 Psalm 119 is particularly nice as it retains the English spellings of the Hebrew letters and prints them as headings in red. Poetry is the only place where the show-through is really that visible. Some of the lines don’t match either. None of this is enough to bother me, but it is there. 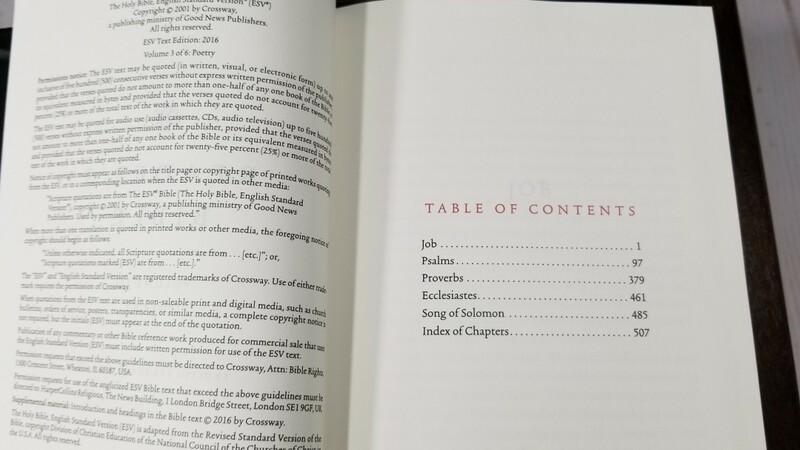 In the front is a Table of Contents of each book. 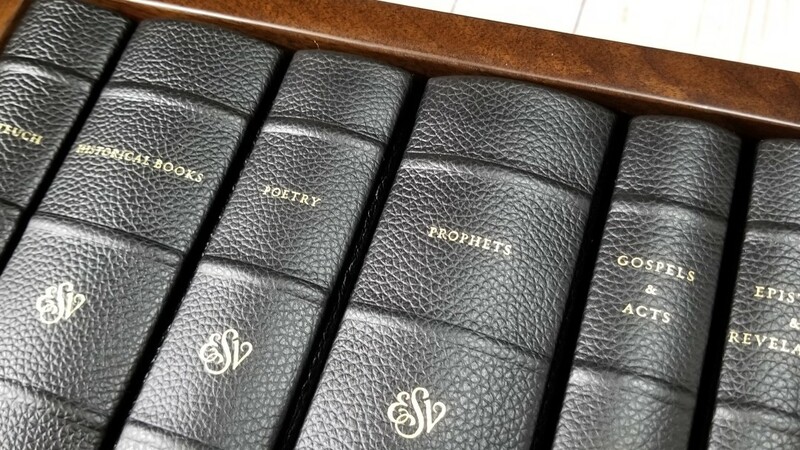 It shows which Bible books are in that particular volume with the page number where they start. 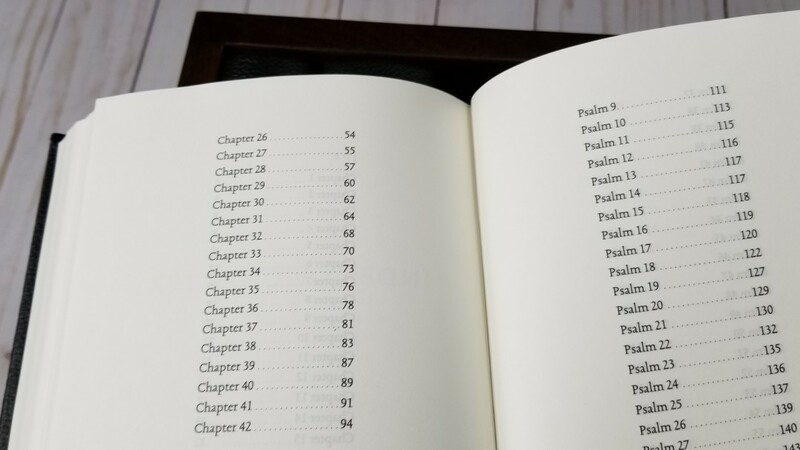 Each book has an index to the chapters in the back that shows the name of each book in this volume with a list of chapters and the page number for each chapter. It’s still difficult to know exactly where on the page the chapter starts, but they do get you on the right page. 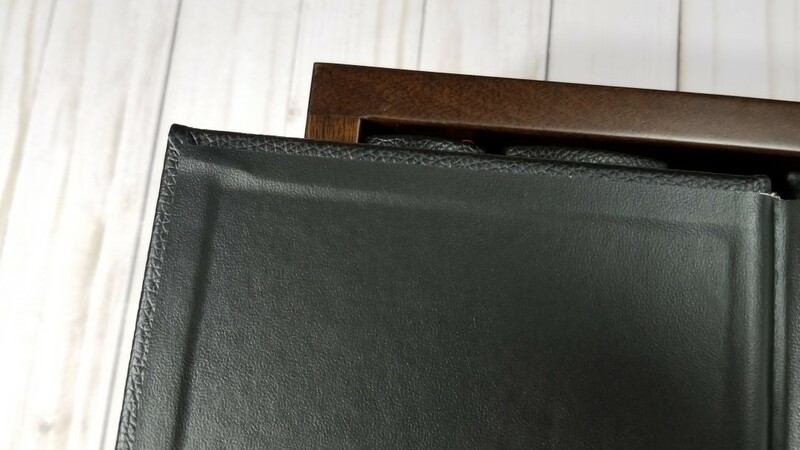 Unlike the cloth over board edition, this one has a Black Walnut case without any designs, cutouts, or tracks to hold the books. 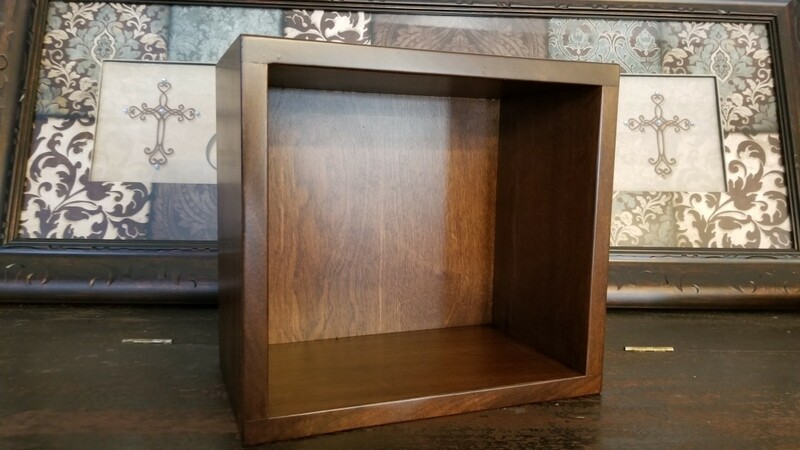 It’s built by Amish craftsmen in Indiana with Black Walnut from the eastern US. The wood includes knots, burls, and wavy grain patterns for a natural look. 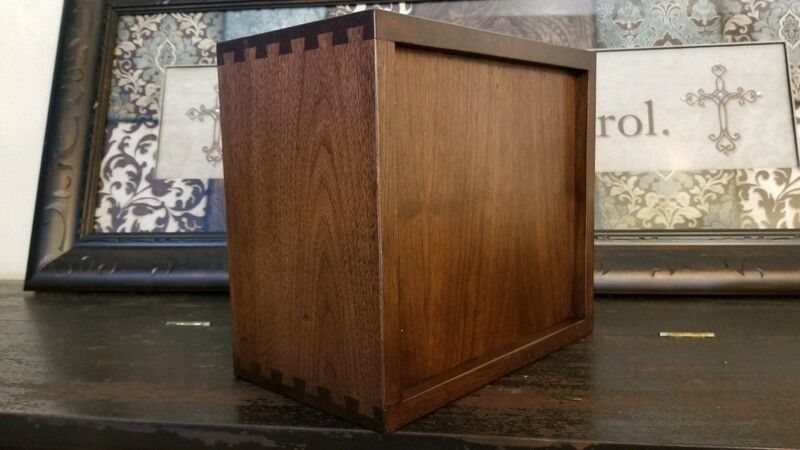 It’s built with hand-cut dovetail joints. The books fit a little bit loose. Also, it doesn’t have the cutaway at the top to help make it easier to grab the books. I still had no issues pulling the books from the case. I’m sure them being loose in the case helps this. 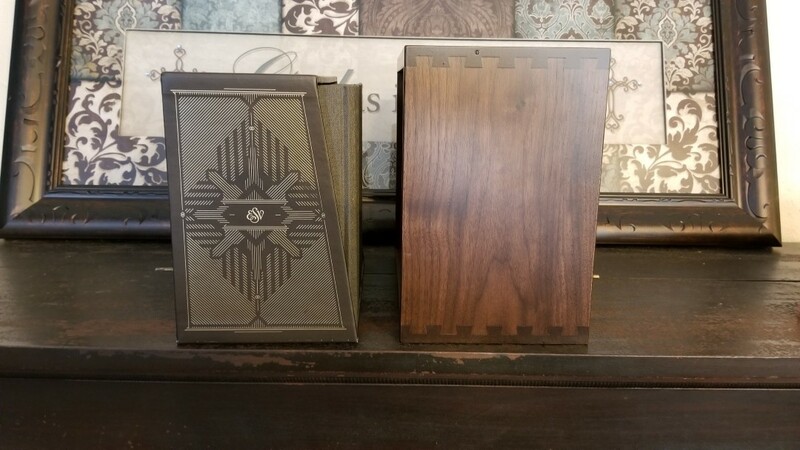 The cardboard slipcase of the cloth edition is nice, but this walnut case is by far better. 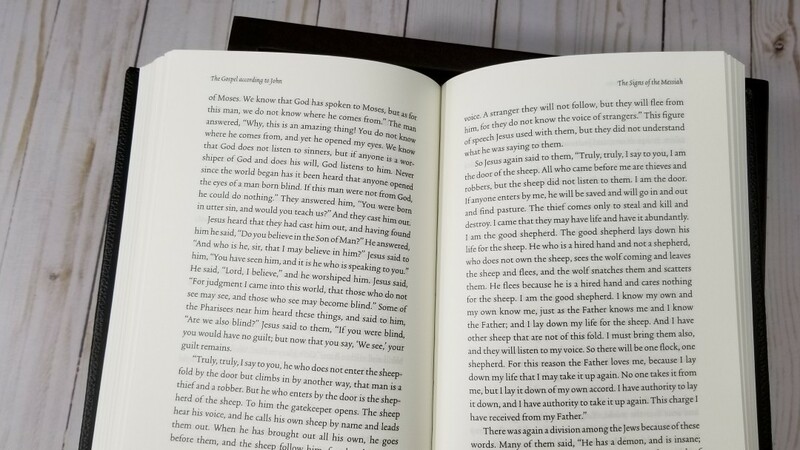 The lack of chapter and verse numbers makes it difficult to follow most reading plans, but Crossway provides several reading plans on the reader’s Bible website. 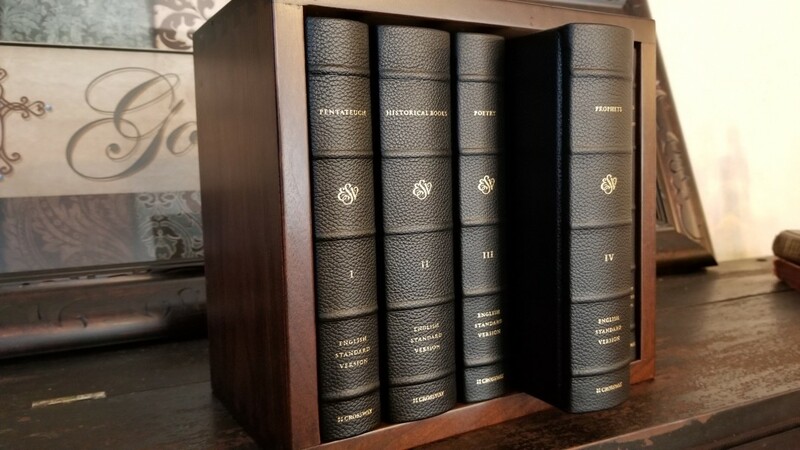 A plan for each volume so you can read all 6 volumes simultaneously through the Bible in one year. The plans include the number of each day, the page range for that day, and a checkbox so you can check off each day as you go. It doesn’t mention the book names or chapter numbers. The case for the cloth edition is heavy cardboard that’s covered with an elegant design. It includes tracks for each of the books to slide into. The cloth over board is a nice cover. It doesn’t include spine ribs and the cloth picks up lint easily, but it does look and feel nice. 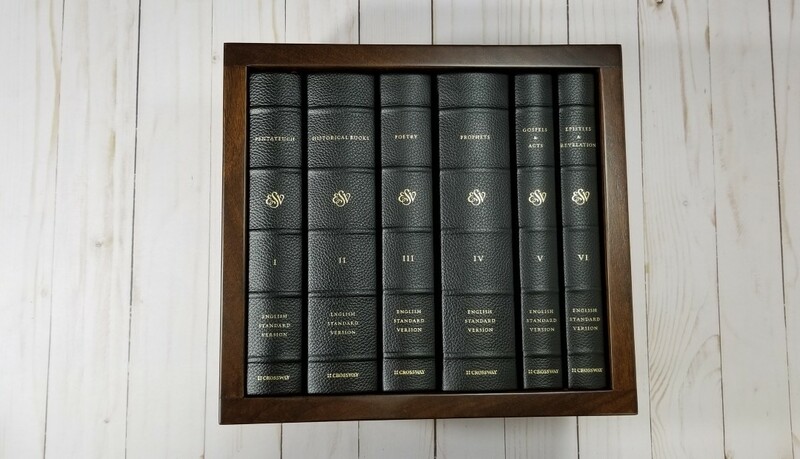 I am a fan of the ESV Reader’s Bible Six Volume Set. 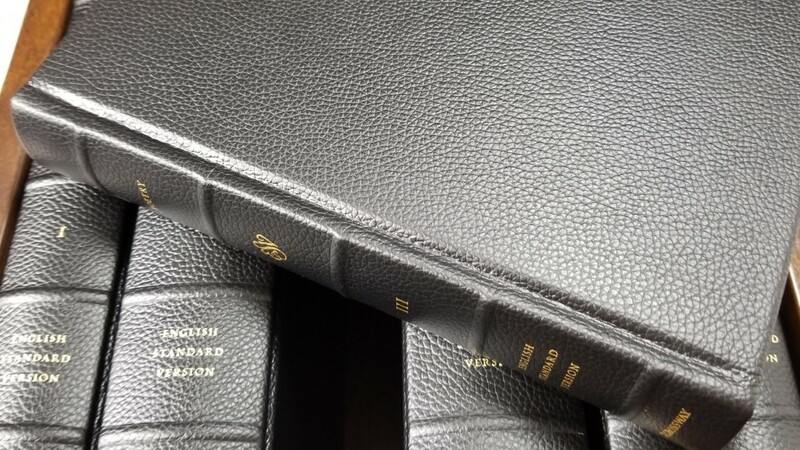 It doesn’t take the place of a reference, study, or carry Bible – but it doesn’t need to. 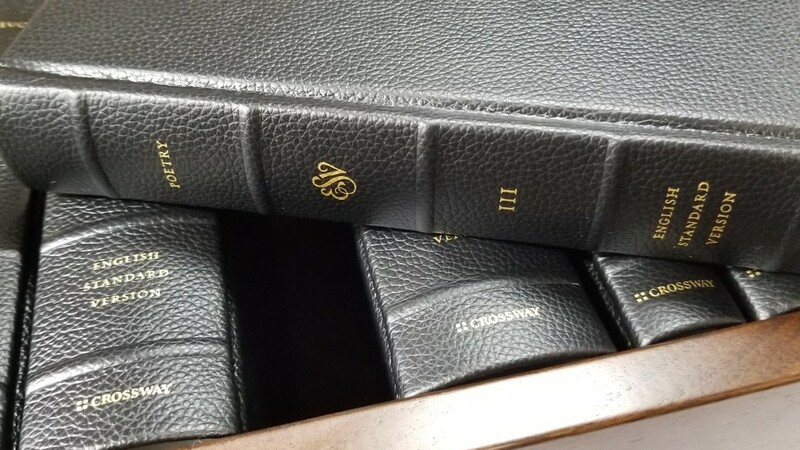 Crossway’s goal was to provide a Bible that was optimized for reading and they didn’t care if it required multiple volumes to do it. 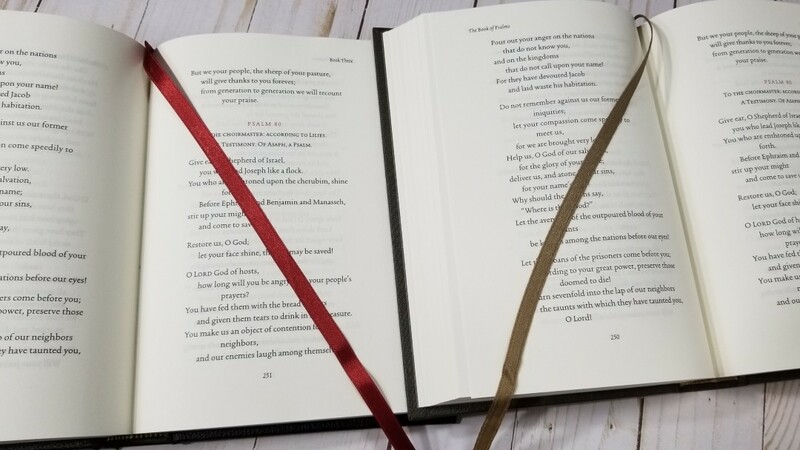 They optimized every element of the design including the font size, leading, line-width, character count, print darkness, paper thickness, paper color, and book size, to create the perfect reading experience. I love reading from it because there are no artificial stopping points or anything to get in the way. 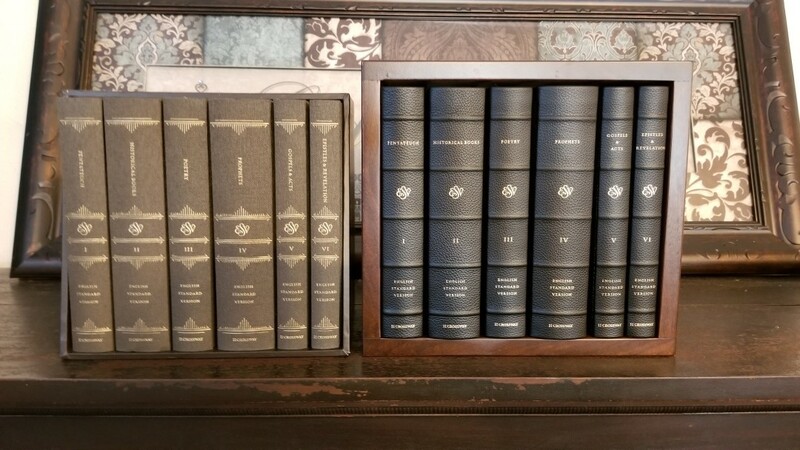 I appreciate Crossway for producing this set. Since it originally released, there have been several other publishers produce something similar in either single or multi-volume sets. 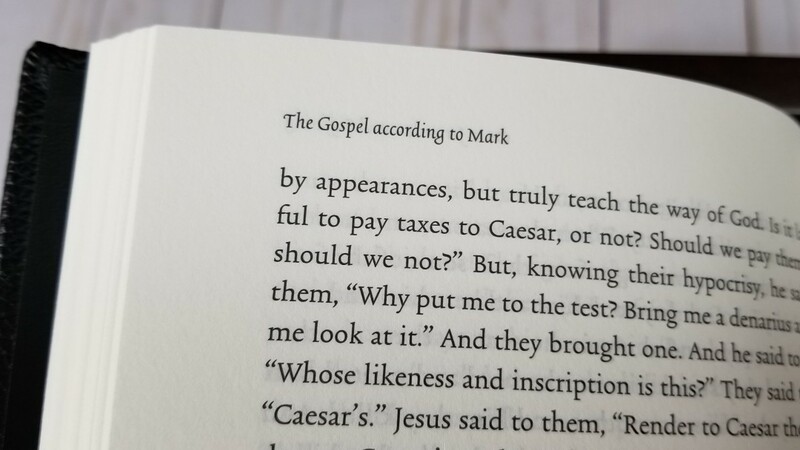 I’m glad to see this has caught on and I hope to see even more editions that are optimized for reading (I am still waiting on the perfect reading KJV though. It would look a lot like this one – poetic settings and all). 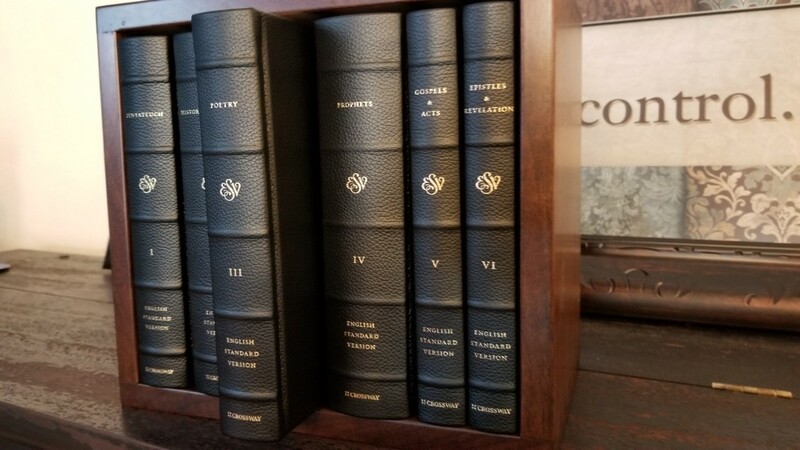 I highly recommend the ESV Reader’s Bible Six Volume Set in cowhide to anyone that loves reading the ESV. For anyone that doesn’t want to invest in the more expensive edition, I recommend the softcover or cloth over board sets.